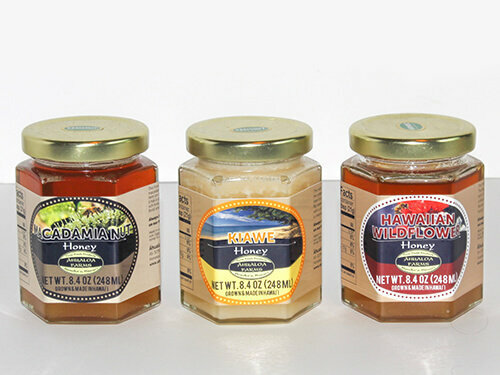 We have partnered with an amazing Big Island beekeeper who was looking for someone to sell his scrumptious honeys to! Use honey to sweeten your beverages: use on pancakes, french toast, oatmeal, rice pudding or as a glaze for ham or pork, to name a few. Kiawe Honey $15.00 - This honey is gathered from a Kiawe forest on the Big Island of Hawaii. Since the land is like a desert, no other vegetation has been able to grow, allowing the bees to collect only Kiawe nectar. For the beekeeper, gathering Kiawe honey is a painstaking process since it requires precise timing. If collected too soon it won't be ripe, collected too late and it crystallizes in the comb. This honey is very creamy with a rich, tropical flavor.